The consolidation of control rooms was conducted in several refineries in the 1990s and early 2000s as a means of reducing the number of operators and improving efficiency for enhanced competitiveness. The characteristics of consolidated control rooms vary, reflecting the history of a refinery. However, the adverse business environment in recent times has meant that the oil industry has had to consider approaches other than consolidation. In many plants, migration of the distributed control system (DCS) gives an opportunity to investigate the control room configuration and operational management system for achieving safer, more stable and more efficient operation. This article describes refinery modernisation activities that led towards an ideal refinery that enables safe, stable and efficient operation. 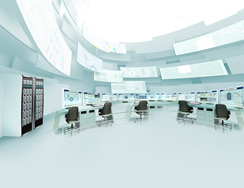 In the example described, Yokogawa was asked to contribute to a major part of the modernisation relating to DCS migration and control room consolidation. Yokogawa offered the Refinery Operation Modernisation Service, one of its VigilantPlant Services, which features four solutions: consolidated refinery production control including consolidated control room design; operator training system (OTS); capture and amalgamation of best practices (SOPs); and safety instrumented system (SIS). The segmented organisation resulted in differing requirements for the education and training of operators, different spare parts for the DCSs, and different procedures for the maintenance engineers. To solve these problems and to more actively achieve safer and more efficient operation of the refinery, and to transfer the knowledge of veteran operators, the refinery decided to combine the processes of consolidating the production organisation and control rooms with the migration of the production control system to the latest one. The refinery authorised a phased plan towards an ideal refinery to meet the demographic challenges presented by knowledgeable veterans retiring and their places being taken by less experienced personnel, with a target date of 2013 (see Figure 1). In Phase 1, the consolidation of control rooms and the migration of the production control system were scheduled to be completed in June 2009. 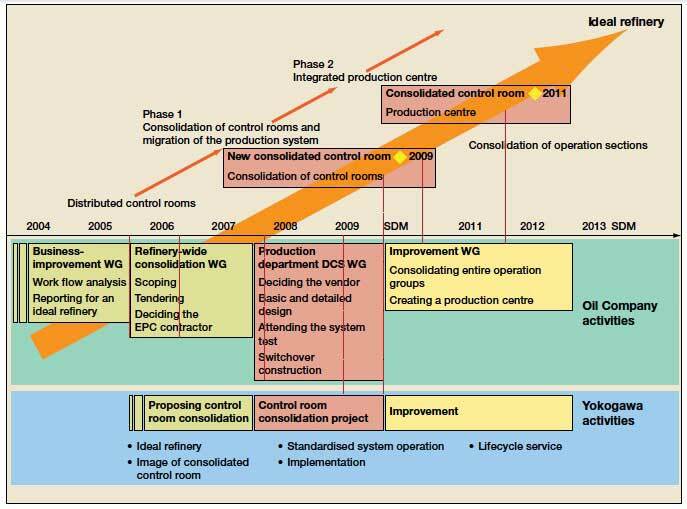 After the physical migration, organisational re-engineering was planned, as Phase 2, to establish the "consolidated operation centre" by 2011. This project was triggered by a report by a business improvement working group to the refinery's top management in 2004. Until the formal launch of the project in 2007, the control room consolidation working group in the refinery identified the issues involved for safe, stable and efficient operation, as well as the training of younger operators for knowledge transfer. During this preparation phase, Yokogawa proposed a visual concept of an ideal refinery and the human-centred configuration of the consolidated control room, including its migration plan, in collaboration with the refiner's working group. In Phase 1 of the project, named the control room consolidation project, Yokogawa undertook the migration work including control room design. The refinery was operated by six sections: the on-site plant sections 1-4, the power and utilities section, and the offsite section, distributed in four control rooms. The initial study concluded that the control rooms should be consolidated into one by constructing a new control room, and that the control systems should be migrated, taking the opportunity of a large turnaround scheduled for June 2009. The planned DCS migration was not a simple replacement of each existing DCS system, but introduced a supervisory DCS that could control and monitor the whole plant. It also included implementation of the consolidated safety instrumented system (SIS) to enhance the safety of the entire plant. Prepare the environment for the above two major aims by constructing a new consolidated control room and a new system, thus establishing operational integrity. High availability of the systems: the intention is to improve availability of each device, network and piece of software by designing the systems with full consideration of systems operation and maintenance. Yokogawa proposed the Refinery Operation Modernisation Service to solve the various issues in the refinery. It consists of four solutions: the consolidated refinery production control system; consolidated control room design; OTS; and SIS for the refinery. The proposed consolidated refinery production control system utilises the full functions of Centum VP, Yokogawa's latest integrated production control system. The system can realise efficient refinery operation in a consolidated control room by covering a broad range of plant areas and by incorporating many applications such as advanced process control, operation assistance, alarm analysis and SISs (see Figures 2 and 3). A space-saving layout by adopting portable HMI consoles that are online detachable from the DCS bus. The supervisory DCS is installed on top of each unit DCS that collects refinery-wide data, such as utility data through the refinery-wide DCS bus, and monitors the performance of the refinery. The supervisory DCS also has a refinery-wide control function such as utility balance, and plant manipulations can be carried out through local DCS HMI. In the future, this supervisory DCS will play an important role for total production management of the refinery, from crude processing to product shipping. The consolidation of multiple large systems such as the total refinery system without losing information was achieved by a high-speed network. 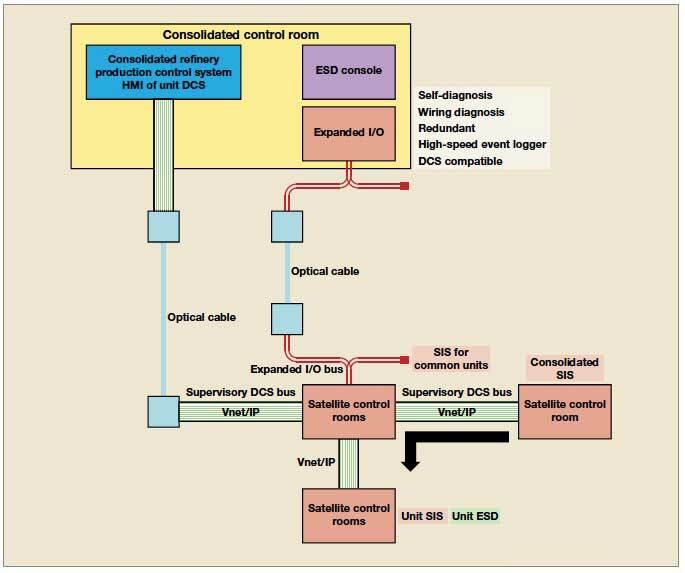 Yokogawa provides the Vnet/IP large channel-capacity DCS bus, which eases the restrictions on data communication between devices and systems. The terminal service function of the Centum VP provides an environment for remote viewing of DCS screens. All the information in the DCS is visible in real time from anywhere in the refinery, whether in meeting rooms or at individual desks in offices, through the ubiquitous LAN. This helps to transfer operational expertise and develop human resources. Standardising and improving operation methods In the course of the system consolidation, existing different system specifications must be consolidated into one standard set of specifications. These include specifications for applications and HMI. In standardising the system interface, operation procedures were also reviewed and improved by applying enhanced standard operating procedures (SOP) for eventual standardisation and as such ready for further evolution, thus providing an environment for transferring expertise and continuous improvement of operator skills. Large-scale complex systems require vigilant design to improve integrity and availability. Highreliability design policies including redundancy, duplication and quick system recovery are adopted. In addition, remote maintenance enables problems to be detected and solved at an early stage, leading to stable operation. 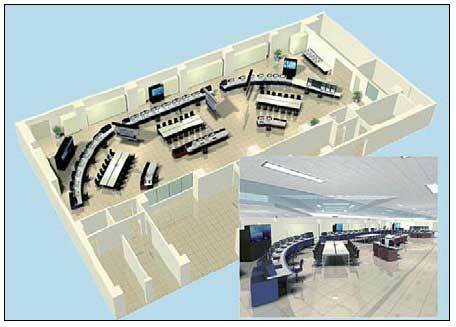 For the new consolidated control room, Yokogawa designed the layout, lighting and acoustic systems, taking into account ergonomic factors such as operability, workability, visibility and comfort. The control room layout also takes such factors as communication between sections and future expandability into consideration. As a result, the new control room is human-centred in terms of both comfort and vigilance (see Figure 3). In 2008, the refinery introduced a new type of fluid catalytic cracker as its second unit. The new unit was very different from the existing one in operation, and so the refinery decided to introduce an OTS to ensure a quick start-up. The OTS was configured by combining Yokogawa's OmegaLand dynamic simulator alongside the DCS. Moreover, since the existing DCS was migrated to the latest version of Centum VP accompanied by the consolidation of control rooms, the OTS was also used for operator training of the new operation screens for the consolidated refinery production control system. This reduced the risk involved changing a DCS vendor and enabled quick start-up of the new DCS. The OTS was set up in the newly constructed training room, and a new system for the crude distillation unit (CDU) was also developed to transfer the expertise of veteran operators. Taking the opportunity of DCS migration, the consolidated SIS was installed to enhance the safety of the entire refinery. The existing emergency shutdown (ESD) system using a conventional relay system was replaced with the SIL3-certified ProSafe-RS safety instrumented system, which meets all requirements covered by IEC 61508/JIS C 0508. 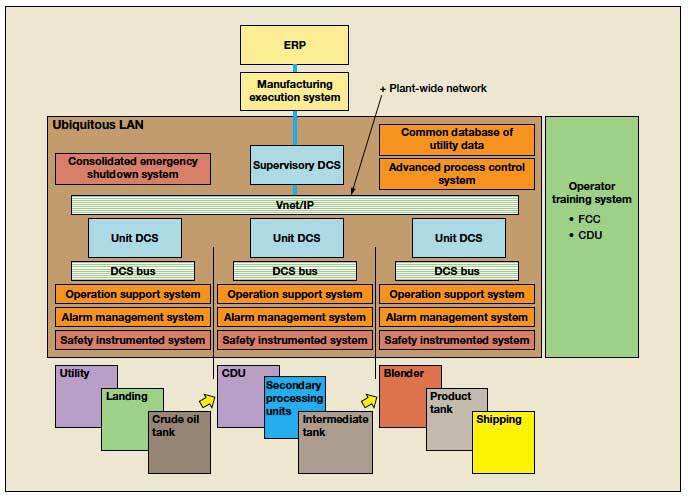 The SIS is part of the core infrastructure of the consolidated refinery production control system for safe and efficient operation (see Figure 4). The system can also be integrated with the DCS and ESD triggers, and events can be seen on the same HMI of the DCS. Emergency responses can be carried out on the HMI display of the DCS along with the new ESD console. Partial stroke test of emergency shutdown valves. 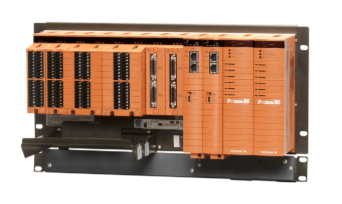 ProSafe-RS is not a simple replacement of a relay-based SIS distributed throughout the refinery, but a refinery-wide SIS that will also provide simultaneous emergency shutdown of the entire refinery along with automation of the prioritised emergency pressure reduction sequence in the event of a large-scale earthquake. The migration of the DCSs throughout the refinery and the migration of the existing ESD circuit to ProSafe-RS had to be completed during the short period of the scheduled turnaround in 2009. Table 1 shows the outline of the migration. Although it was a big project, it was completed in just 14 days. System migration in such a short time and without any trouble was achieved thanks to meticulous preparation, detailed scheduling including resource allocation, a startup team supported by a backup team, specialists and subsystem engineers capable of quick troubleshooting, and a "hot line" to the quality assurance department. Among the many positive effects of the consolidation of the control rooms, the greatest is a sense of unity and face-to-face communication between people, allowing them to broaden their outlook by working together. The renovated control room makes people feel relaxed and secure, and as a result they can concentrate on plant operation. Improvements in data integrity and data availability accelerate communication between units to optimise the operation among units. Standardisation of operational procedures, a secondary effect of the system consolidation, has promoted the transfer of operational expertise. Introduction of the SIS has enhanced safety. Another intangible but valuable effect of the renovation is the motivation of young operators. They are stimulated by the new control room, the new systems and the new way of plant operation, as are all the people in the refinery. Continuous improvement activities towards establishing the production centre are expected to create a variety of effects in the future. System migration Simultaneous migration of 144 field devices. The consolidation of control rooms and the migration of the production system prepared the infrastructure for further improvements at the refinery. The next steps towards organisational and operation procedural renovations have started. Increased productivity of operators as a result of consolidation will be used for further improvement of plant operation as well as human resource development. Yokogawa continues the development of industry solutions such as Production Instructor and Exapilot, contributing to the tasks of capturing, amalgamating and optimising operational procedures as a contribution to operator effectiveness. The consolidated control room is now the centre of operation and it will be an enabler of two-way optimisation of refinery operation, both refinerywide and organisation-wide. The refinery can be operated refinery-wide as one unit, while organisational integration can realise flexible production to accommodate a changing environment. Eric Jan Kwekkeboom is Business Development Manager, Oil & Gas Downstream Industry Solutions, with Yokogawa Europe and Africa in Amersfoort, The Netherlands, managing market development in oil and gas downstream business, refinery and petrochemical industry segments in particular. He holds bachelor's degrees in process engineering and chemical engineering and graduated in business-to-business marketing.